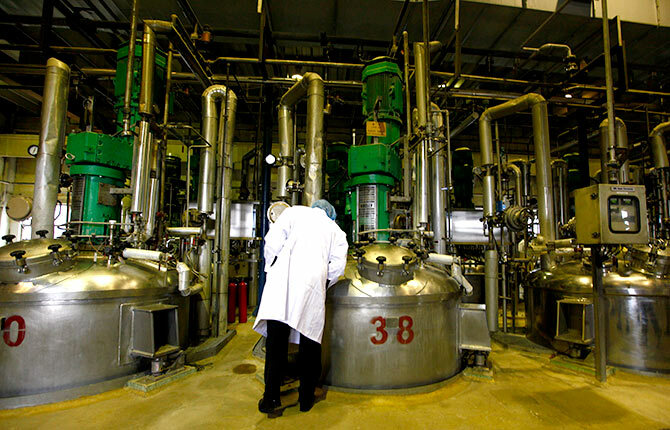 Rediff.com » Business » The future belongs to biopharma. Can India catch up with China? The future belongs to biopharma. Can India catch up with China? If we are to realise the full potential of biologics' ability to improve people's health, it is essential to encourage public policy and support R&D. IMAGE: It’s been evident for a decade now that biological drugs are the future of medicine. Photograph: Robert Pratta/Reuters. China and India together account for close to 40 per cent of the global population. They are among the three largest economies -- on a purchasing power parity or PPP basis -- in the world, and are the two fastest growing emerging economies in the world. They are also the two countries that will most likely be the world’s largest hubs for manufacturing biological drugs. 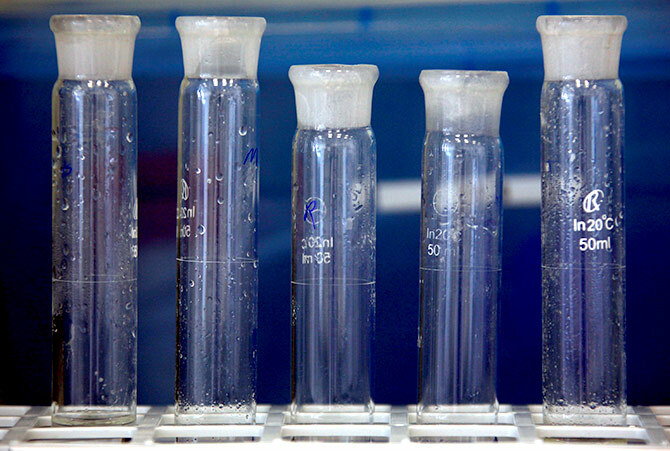 It’s been evident for a decade now that biological drugs are the future of medicine. (A biopharmaceutical, also known as a biologic(al) medical product or a biological or a biologic, Wikipedia says is "any pharmaceutical drug product manufactured in, extracted from, or semisynthesised from biological sources -- therefore different from totally synthesized pharmaceuticals -- they include vaccines, blood, blood components, allergenics, somatic cells, gene therapies, living cells or tissues, recombinant therapeutic protein, and living cells used in cell therapy). IMAGE: China has already emerged as a leading consumer market in biopharmaceuticals. By 2020, the size of China’s biopharmaceutical market will be second only to the US. 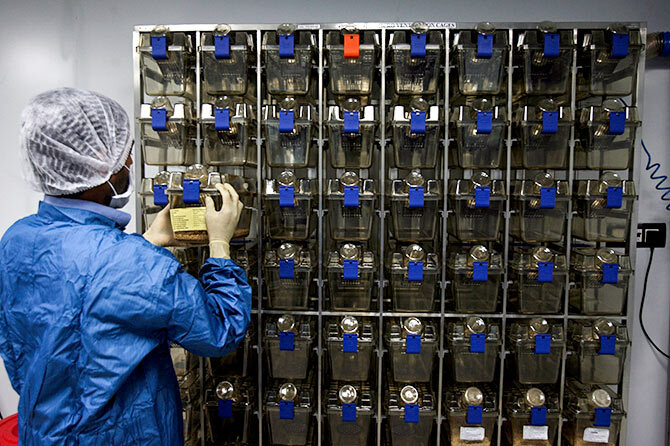 Here, containers are seen in a laboratory in an enzyme factory of Danish biopharmaceutical company Novozymes in Beijing, China. Photograph: David Gray/Reuters. Throughout the global pharmaceutical industry, numerous innovations abound: From immunotherapies, antibody drug conjugates (antibodies attached to biologically active drugs), companion diagnostics, combination therapeutics and gene and cell therapies, to name just a few. The market for medicines is set for significant disruption, as we move into the age of personalised medicine. How ready are we, though, to both exploit the opportunities biologics offer, and derive the benefits of these new and extraordinary medicines? Both are highly and densely populated countries, with the associated health hazards that such regions come with. Population density makes both nations susceptible to diseases that are now escalating into global epidemics; in both countries, non-communicable diseases, or NCDs, cause more than half the deaths annually. The emergence of drug resistant strains of diseases is another threat, leading to higher economic costs from illness and disability. For example, India and China account for over 50 per cent of global multi-drug resistant tuberculosis cases. China’s biopharmaceuticals industry will be developed to scale during the 13th Five-Year Plan period, with a focus on enhanced innovation capacity, industrial structures and international cooperation. IMAGE: If India is to realise its full potential of novel biologics to improve people’s health, it is essential to encourage public policy and regulatory environments to support research and development that drives biomedical innovation. Seen here: A pharmacologist works inside the bio safety room at Natco Research Centre in the southern Indian city of Hyderabad. Photograph: Krishnendu Halder/Reuters. Their FYP describes a plan to double the industry’s scale through the broad application of genomics and other biotechnologies, networked application demonstration, and the scaling up of a new generation of biotechnology products and services, including personalised treatment and innovative pharmaceuticals. China has already emerged as a leading consumer market in biopharmaceuticals, which is set to be a major segment of China’s advanced consumer market over the coming years. By 2020, the size of China’s biopharmaceutical market will be second only to the US. China has already taken the lead in creating a regulatory framework for the development and manufacturing of biologics. Beginning with data protection for 10 years, China has shown its intent in fostering innovation and becoming a force to reckon with. The Chinese approach of linking government, industry and academia in the pursuit of creating a sound base for developing biologics also demonstrates national commitment towards encouraging new and innovative drug therapies to address unmet medical needs. India has some serious catching up to do! If we are to realise the full potential of novel biologics to improve people’s health, it is essential to encourage public policy and regulatory environments to support research and development that drives biomedical innovation. While India is one of the fastest-growing economies in the world, the country’s healthcare system clearly illustrates that the very low public spending on healthcare has resulted in inadequate infrastructure and inadequate appropriately skilled manpower in public health facilities, especially in rural India. IMAGE: China’s biopharmaceuticals industry will be developed to scale during the 13th Five-Year Plan period, with a focus on enhanced innovation capacity, industrial structures and international cooperation. Seen here: An enzyme factory in Beijing, China. Photograph: David Gray/Reuters. Health insurance coverage is low. We have one of the world’s highest rates of out-of-pocket spending in healthcare. If India wants to catch up with China (and the developed world) it is but imperative that we get our act right. We need regulatory data protection; approvals based on scientific evidence and government-academia-industry collaboration. To stay competitive, we have to be future-ready. 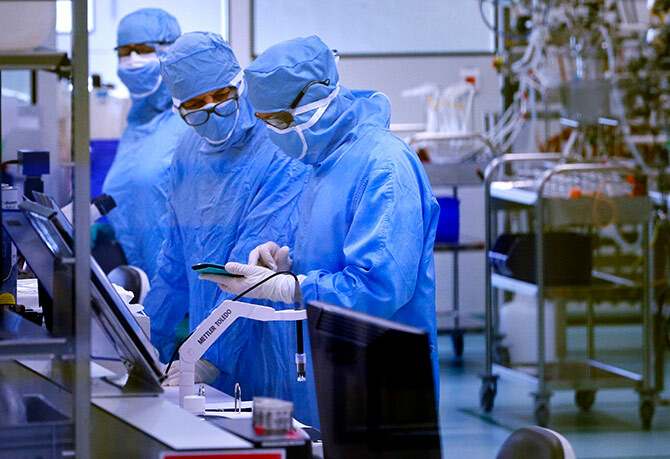 To get there, the government will have to lead the way: create a predictable and conducive environment, put in place the appropriate regulatory framework and let innovation in biologics do their magic. Let the future begin. Kanchana T K is the director general, Organisation of Pharmaceutical Producers of India, which represents all research-based pharmaceutical companies in India.